It's challenge time at JoyClair and this month we'd love to see you create a project using these lovely colors. 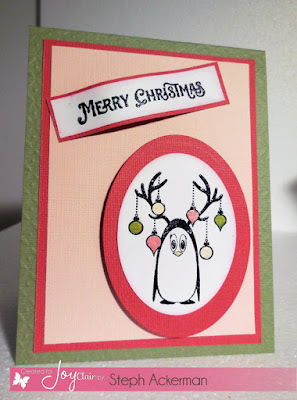 I used the cute Christmas Penguins clear stamp set. I stamped her first in black ink and embossed her. 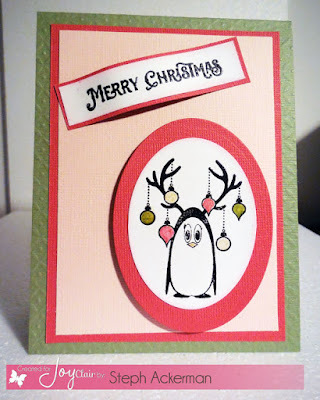 Then I added color to the ornaments using Clearsnap Smooch Accent Inks. Once die cut, she was matted on a larger die. The card is green cardstock and 2 layers of pink were added on top. Merry Christmas is from the Cozy Snowman Wishes clear stamp set, then formed across the top of the card. Your penguin is so adorable with thoe colorful ornaments hanging from his antlers! So cute - I LOVE that stamp set! Great job Steph, I really need to get this set..